I have made three pairs of overalls that have a straightforward, utilitarian design- not a lot of frills or shaping (which is what I wanted at the time)- two for me and one for Claire. I blogged about the makes for myself with the Turia dungarees here and here and I wear both pairs an awful lot- they are much loved and much worn (despite a few issues I had with the finishing techniques in the pattern. 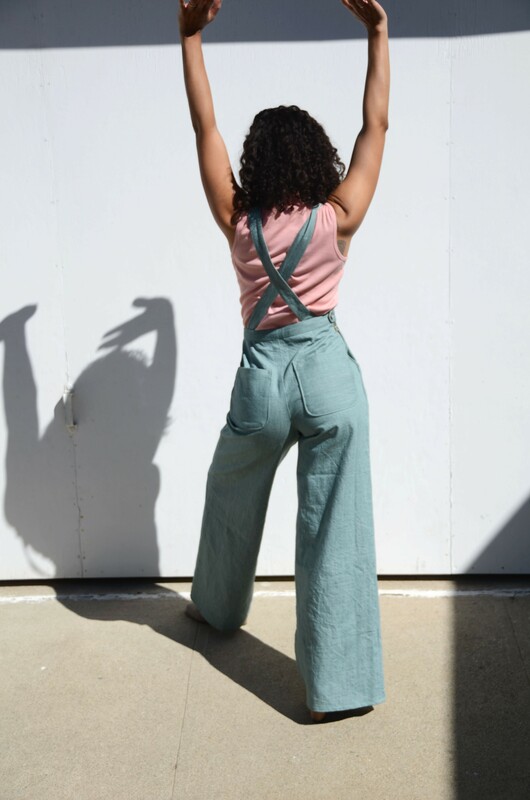 But when Closet Case Files came out with the Jenny Overalls earlier this year, I was super excited to make them because they have such a cool shape and style, with a more aesthetically interesting flourish than the pairs I had made before. 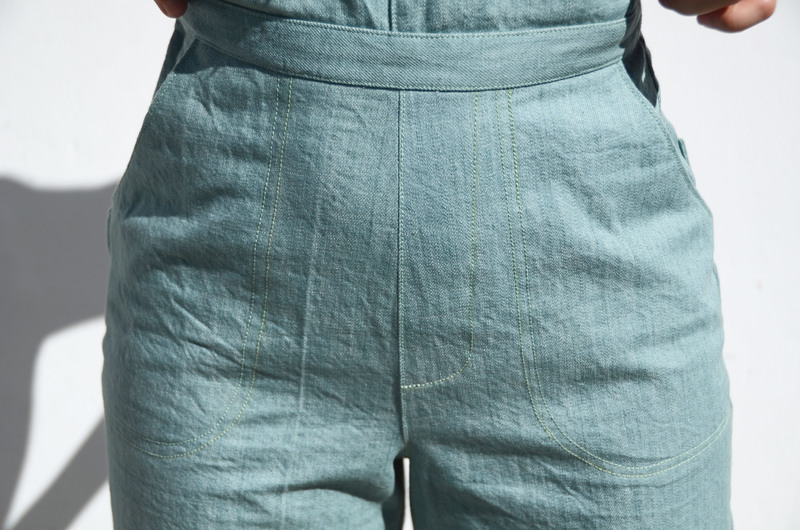 The Jenny’s have a bib and separated bib pocket on the front, but they don’t have a back piece; instead, the straps are placed at the back of the pants waistband and criss cross over the shoulders to connect at the front bib. I love that detail because it doesn’t cover up the whole body in the way that many overalls designs do, and it allows you to show off a pretty shirt or tank with some interesting detailing or print. The pants have slant side pockets which I also love, but my favorite thing about this pattern is the way the pants are drafted- the legs are slim in the hips but wide through the thigh/knee/calf, and it gives the whole look a bit of a vintage flair. They also sit high on the waist and aren’t slouchy like most overalls patterns can be. 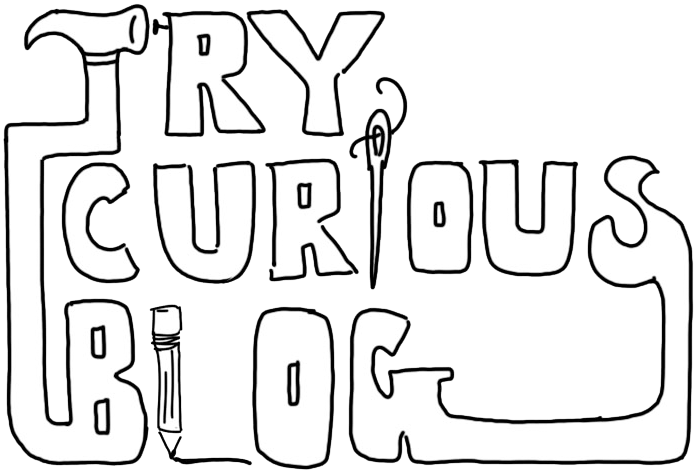 Again, I love the old school overalls look, with their ease of wear and wide waist- my Turia Dungarees can be thrown on over a tank top, paired with some Birkenstocks or sneakers, and I can be out the door in no time, looking comfortable and cute. But the Jenny’s feel fashion forward in a way that my Turias don’t, and I just LOVE having these options in my wardrobe. I decided not to overfit the waistband of my Jenny Overalls and allow a little bit of extra room for movement, comfort and tucking a shirt in them, but they are still much more snug at the waist and hips than my Turias. I opted for the functional slant pockets (you can also omit them), the topstitched faux fly on the front, faux flat felled seams, and one side zipper (I thought I would need two, which is an offered option that I deeply appreciate since I have a hard time getting into snug high waist pants with my hips, but since I made the waistband a little looser than normal, I was able to get away with just one). An option is also provided to use jeans buttons at the hips instead of zips, and Heather sells overalls and jeans buttons hardware from her store, which I quickly snatched up (the Dritz overalls buckles that I bought and used for an earlier pair of overalls have held up fine, but have never felt as sturdy or looked as nice as I wanted them to). The instructions for this pattern are, like all CFF designs, straight forward, and easy to follow. Sewing and topstitching a multi-faceted make like this is SO FUN, especially when you trust the designer and don’t feel like you have to keep your eyes out for missing steps or finishes. The only issue I had with these (and I had the same issue when I made Claire the Jenny shorts this summer) is the zipper insertion at the side seams. Because of the thick denim coupled with the pocket lining, the seams are really bulky and it was hard for me to get the topstitching around the zipper perfectly straight, although I did the best job I could. I don’t think the zipper detracts at all from the overall look of the garment, meaning it isn’t noticeable and the stitching doesn’t look painfully wobbly- as least not by the Three Feet Rule, haha. I used the mint green Cone Mills colored denim that Threadbare Fabrics has been keeping in their shop this summer and it has been an excellent pairing with this pattern- the denim is on the lighter side of mid-weight but still firm and stable, so it doesn’t make these overalls feel too bulky or heavy, which is important to me since I will be wearing them in a fairly climate. Figuring out the hem of these pants was tough for me- originally I had planned to make the cropped version, but since I started making these overalls right after I had made the Molyneux for Vogue Dress-Turned-Jumpsuit (in which I hacked the cropped length of the Jenny pants onto the Molyneux bodice), I realized I wanted to use a different silhouette so I didn’t have two versions of the same jumpsuit in my closet. I am really glad I went with the full length- it will allow me to wear these overalls far deeper into the Cali winter than my cropped version would have permitted (and perhaps into the winters of other cities, too??). I couldn’t decide if I wanted to have the ground skimming hem or a slightly higher hem that shows more of the shoe, but wide legged pants hems are ALWAYS very tricky for me, and I have to be very specific about which shoes I will be wearing with said pants before dedicating myself to the length. Once I realized that these overalls matched best with my heeled booties as opposed to my clogs, the hem length made itself very obvious- the longer, floor skimming length was perfect! The days are finally cooling down now (and for LA that means high 70s) so these overalls are prime fall attire. In these photos I paired them with a pink Niko top by True Bias I made last year, but I just recently sewed up a replica of this sleeveless turtleneck in a cream colored 1×1 rib from The Fabric Store that I think is going to look amazing and make me look a tiny bit less like an easter egg. I will surely grace instagram with this completed look soon, so keep an eye out!